Montreal Taylor Alfred Chalifoux with Charles Chaput representing France, in his hand a small flag with the colors of the three allied powers, France, England and Turkey [the allied powers fighting in Crimea those times]. 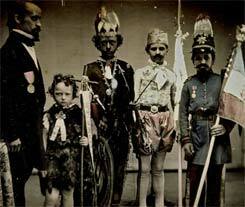 Second on left - Loiselle representing St. Jean-Baptiste, Théodore Deschambault as Jacques Cartier and Jean Damien Rolland Indian Chief. Each of these small persons were dressed, decorated and armed according to the historical truth and was admired by the nice effect of the costume and of the gracious mine.